Food Review: Anthony's On the Hill | Food and Drink | Style Weekly - Richmond, VA local news, arts, and events. Every neighborhood needs a place like Anthony’s. 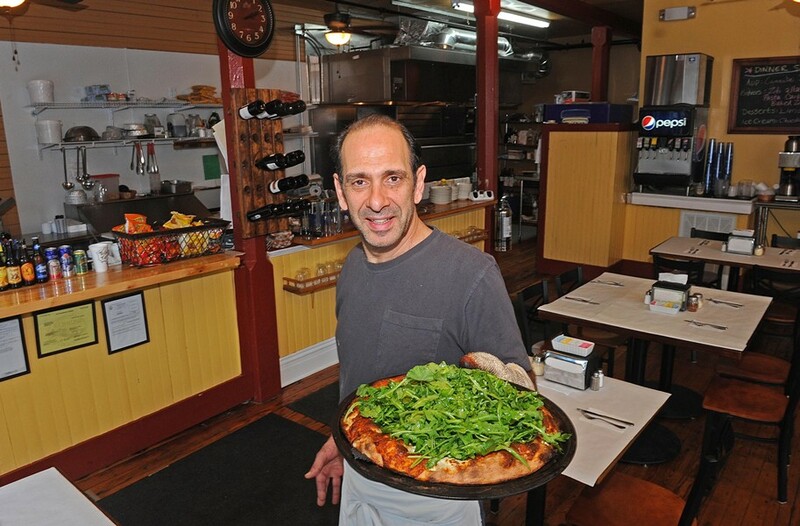 Michael Calogerakis shows the white pizza with arugula, lemon oil, ricotta and mozzarella at his Church Hill business, Anthony's on the Hill. Good old-fashioned city neighborhoods used to have hardware stores, pharmacies and, once upon a time, pizza places where peewees and their parents would gather to soothe wounds and celebrate victories. At Anthony's on the Hill, Michael Calogerakis' casual Italian-American restaurant, the checkered oilcloths of mom-and-pop spaghetti joints are updated to butcher paper, but the shakers of Parmesan cheese and crushed red pepper remain, as does the menu of pizzas, pastas and sandwiches. That's the draw for Anthony's on the Hill: It's a neighborhood place. Regulars' orders are remembered. The windowed room beckons Church Hill's historical houses. Open for lunch and dinner, carryout or eat-in, Anthony's aims to please, and Calogerakis, former owner of the Flour Garden bakery, tends to greet every table. Our lunch of eggplant Parmesan, Italian sausage and deli meat sub ($8.25 each) is served warm with a bag of chips and a hello. The eggplant, dampened by tomato sauce and olive oil, is less cheesy than at other places. The whole-link sausage is sweet and spicy. Sub rolls are toasted, but purchased, and that's a little disappointing knowing that the owner is a professional baker — though I do understand the space and time requirements for baking bread. Calogerakis isn't tapping into his baking skills at Anthony's. He prefers to save his talents for the pizza dough, which is perfectly salted, yeasty and tender. Anthony's pizza-making style is quasi-Neapolitan, sort of a Stuzzi-meets-Bellytimber fat crust. Puffy pizza spines are oven-blistered and lapped by homemade sauce. Simple toppings such as fresh herbs, mozzarella and house-made meatballs may wink at Italy, but send a Bronx cheer to the gooey New York slice. Delicately rolled chicken saltimbocca ($12.50) is stuffed with fresh sage leaves and prosciutto. A heavy hand fans the sautéed red and orange peppers on a generous side of pasta. If you believe the maxim, "You only have one chance to make a first impression," then appetizer specials and salads are a blind date's Hail Mary. Our cannellini-bean appetizer ($6.95) arrives filled with sun-dried tomatoes, but briny feta and parsley help temper the tomatoes' pungency. Caesar salad ($4.50) topped with salty cheese and creamy dressing is classic, but would be better without a king's ransom of store-bought croutons. The house salad ($3.75), chockablock with veggies, is a fresh distraction from the dead flies on the window ledges, present on both visits. First impression: The uninvited guests are overlooked, because the rest of the dining room and the exposed wait station are as clean as church. At lunch, the whir of the Pepsi machine and clank of the kitchen blends into the salesmen pitching their products, but at an early dinner we find ourselves wanting background music to dial down the industrial noise. Instead we drown the distractions in wine, as varied as pinot grigio and primitivo, with bottles priced in the low 20s. Beers include New Belgium's Shift among the handful of choices. Lunch: Tuesday-Saturday 11:30 a.m.-2:30 p.m.